I've never seen Citizen Kane. I need to, though. . .
Never saw E.T. Avatar I saw while on jury duty. It actually was not too bad. The way I grasp the movie related to some other films I've seen. Basically a spy falling in love with the enemy when he learns the enemy is not all that different from him. It's not a bad story. Otherwise the only movie from Hollyweird I actively saw in a theater in the last 20 years, was Bridge of Spies, but being a product of the cold war and living in the front line of it as a child, has special meaning for me. Good movie. I have a couple of other's from the last 20 years in my DVD collection, but it really is just a couple. Most of the stuff I've plain out avoided, unless it was on OTA TV and I just happened to have the TV on for noise. I prefer the older stuff, American, British, French, Italian, German and some of the Japanese classics. Even old Russian stuff. My most glaring omissions are the second and third Godfather movies. No excuses, I’ve just never gotten around to it. Never seen Brokeback Mountain or La La Land. They both seemed pretty popular when they came out. Godfather or the sequels. Not sure if I ever will. I like all of the actors in that series in other projects but the mafia subject is not of much interest to me. Real classic I have never seen and have no desire to see: Gone With The Wind. I saw The African Queen when I was a teenager. Saw the actual boat on display at the Worlds Fair in New Orleans (1984). Thought that was cool. Great movie, but the scenes with the leeches freaked me out then, and the memory still does to this day. I hate leeches. I only saw the Godfather movies (at least the first one and part of 2 - not sure about 3) when I was deployed, and the people I was working with watched them. I'm not a fan of the 'gangster genre,' but at least the first was pretty good (I heard the 3rd one sucked?). I can't imagine how anybody living in this country could NOT watch the Star Wars movies, though. They are just such a huge part of American culture. There's plenty but the one I haven't seen but really want to is Dr. Strangelove. What haven't I seen. Geez, the list is looooooonnnng. I don't go to theaters very often. I think the last time I did was for the first movie in the Divergent series, and that was because the women wanted to see it. Before that I think it was Revenge of The Sith. Most things, I wait until they show up on Netflix or Amazon. I'm still waiting for a bunch of those to come off of rental status. Yeah, I'm a cheap SOB when it comes to movies. I'm actually thinking about dropping Amazon because so much of the stuff I'd like to watch is PPV. Why the hell should I have to pay to rent a damn movie on top of what I already pay Amazon? Pisses me off. Avatar, same as Divergent - I only watched it because the wimmins insisted on it. Gone With The Wind, lemme think: a spoiled brat and a jerk who just wanted to bang her. Saw it once on TV, no desire to see it again. ET - never saw it. Godfather - never saw it, don't care for gangster stories. Last night I sat up way past my normal weeknight bedtime to re-re-re-re-watch She Wore A Yellow Ribbon. Now that's a great movie. So is African Queen, it's on my list on Netflix. But then so is Catwoman, so what do I know about good movies? The big ones that stick out I haven't seen are Gone With The Wind, The Exorcist, & Schindler's List. Just never got around to them. Among the more recent stuff are many I can't care about. I have never seen "Gone With The Wind." Has anyone not seen Casablanca? 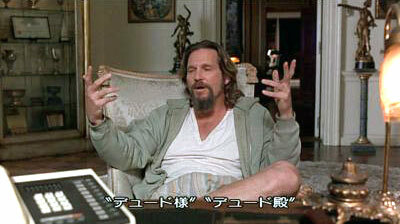 And although The Big Lebowski is not the greatest film ever made, it is the greatest film ever made. All kidding aside, if you're a grown man, you owe it to yourself to see this film. There's no message, but you will laugh. I guess someone would have to tell me what's been popular in the last 30 years or so, then I could respond to the list. To the best of my recollection, the last time I was in an actual theater was about 1980 when I escorted my youngest daughter to The Rocky Horror Picture Show. Movie blew chunks, audience was entertaining. Which, I guess, was the point. Quite frankly, I don't put much stock in "expert" opinions of "great movies". I watch movies to be entertained and if they don't grab me in the first 10 minutes, I'm out. I don't want to have to go to college to "understand" a movie or analyse the damn thing to discover the "deeper meaning" or try to suss out the director's or actor's motivation, or be "wowed" by the lighting or camera angles or all that technical stuff. Pretty much anything in the "Marvel" genre leaves me cold. Wasn't much for comic books as a kid so I've been warped that way for a long time I guess. As an exception, I did find Deadpool pretty amusing. I forget this one, seeing as I never saw it.